Three former members of the Conservative riding association in Vaughan, Ont., are asking Elections Canada to investigate the campaign finances of Associate Minister of National Defence Julian Fantino. Three former members of the Conservative riding association in Vaughan, Ont., are asking Elections Canada to investigate the campaign's finances. In sworn affidavits, Richard Lorello, Tracey Kent and Carrie Liddy allege possible irregularities in Julian Fantino's 2010 byelection and 2011 election campaigns. Fantino won both with massive support from Prime Minister Stephen Harper and that of several cabinet ministers who visited the riding to lend assistance. 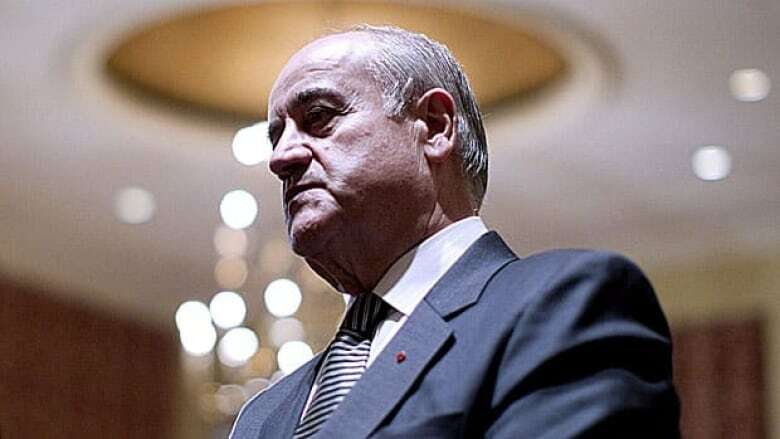 Fantino is now in the cabinet as the associate minister of national defence, managing military procurement files. "Quite honestly, having looked at all the documentation having to do with the Fantino campaign, I can't follow the money," Richard Lorello, who worked on Fantino's campaign, told CBC News. The former Toronto police chief won by 964 votes in the 2010 byelection and was re-elected in May 2011 with a margin of more than 18,000 votes. Lorello, Kent and Liddy have signed sworn affidavits asking Elections Canada to investigate Fantino's campaign finances. They're asking the agency to look at whether the campaign held two bank accounts during the election, one of which they say was used to fund Conservative candidates in nine other ridings. Lorello — who ran for the Conservatives in Vaughan in 2008 — says his own party needs to provide answers. "If we had witnessed the Liberals doing this, Conservatives would have been jumping up and down and complaining to Elections Canada, similar to what we're doing," he said. "All we want is an answer to these questions, so that we know where the money went, how much money was raised, so that we know that a proper election is conducted," Liddy said. Fantino raised an impressive amount of money from Conservative supporters for the November 2010 byelection: almost $500,000, so much that there was a surplus. The three former officials allege that Sam Ciccolini, Fantino's fundraising chair, said at a meeting that there was a second bank account that contained more than $300,000. Lorello, who was then a board director of the Vaughan Conservative Electoral Association, had never heard of this money. He immediately resigned. Kent, also a board director, resigned a few months later. Chris McCluskey, a spokesman for Fantino, said the allegations are baseless and that Fantino's campaign was in full compliance with the law. "Any information suggesting the existence of a second election bank account is incorrect," McCluskey said. He called the departure of at least one of the three campaign workers in Vaughan "acrimonious." The allegations also suggest that nine Conservative candidates in the last election got money from the Fantino campaign, all perfectly legal if it's filtered through the electoral association or the party, and it's declared. It's not known who those candidates were, or if they received anything. Elections Canada won't say whether it's investigating.